How often do you find yourself wondering how long a flight abroad is? Or stuck in a pub quiz trying to arrange Paris, Plymouth, Blackpool and Brussels into ascending order of how far they are from London? Or pondering how Italy could possibly be closer than Scotland. Well, wonder no more. I've laboured to put together a list of distances from London, measured from the appropriate spot beneath the statue of Charles I in Trafalgar Square. They're via great circle routes, ie the shortest distance by air, and not burrowing directly through the core of the planet. And you never know, even if it's not useful, you might at least find it interesting. and you'd already written it. a) It's a book about (hooray) London's lost rivers. b) I was planning to blog about Tom's book anyway, before his PR lackey emailed me about it. c) I paid for my own copy. d) It's better than good. There is something innately fascinating about a lost river beneath a major city. Above ground life bustles on, seemingly unaware of the landscape that existed here before urbanisation wiped it away. But look carefully, if you know where to look, and there are clues to follow and valleys to track. So innately fascinating are London's lost rivers that two books have been published this year on this particular subject. First there was the book I nearly wrote but absolutely didn't, back in May. Full colour, lots of background information, two dozen rivers covered, the snapshot approach. And now Tom's written a second, published a couple of weeks ago, subtly different to the first. Here's why you should buy a copy. As an aficionado of lost rivers, what particularly fascinates me is where they went. It's great to spot evidence on the ground here and there, but what I really want to know is where the trickling stream once ran. That's why, when I decided to spend a year tracking London's lost rivers, I went out and walked all of them. Source to mouth, via outer suburbs and inner estates, following the vanished blue line as best I could. So when I was asked to write a book about lost rivers, I wanted to write about a journey down them. "No," said my publisher, "we want pictorial highlights with a fact-dense textual accompaniment, we don't want a guided walk." Tom's written the book I wasn't allowed to write, he's written a book of guided walks. That may mean it doesn't sell so well, but it's a far more coherent way to write about a subject dear to my heart. Eight of London's lost rivers get the full treatment in Tom's book. From top to bottom, about thirty pages each, mixing walking instructions with fact-dense textual accompaniment about features along the way. Tom isn't averse to pointing out a blue plaque or an interesting building nearby, even if it has bugger all to do with the lost river. And that's my style too, we're neither of us fluvial purists, we're describers of London. It's good text too, packed with freshly dug-up facts, including much about the vanished rivers that I wish I'd known before. Even better, I don't recall seeing much in Tom's exposition that made me go "actually, no, that's a mistake, it was never like that, you've got this wrong." London's lost rivers are a complete nightmare to research - they vanished so long ago - so I know how easy it is to slip in several unintentional untruths. Be it drain covers in Belsize Park, ponds on Peckham Rye Common or Roman temples in the City, I'm not sensing that Tom has got much wrong. Plus there are maps, lots of them in close up detail, depicting where Tom thinks all these lost rivers used to flow. Along Bruton Lane, down Curzon Street, along White Horse Street, across Piccadilly and into Green Park, on one map, for example. There's plenty of artistic licence because nobody knows precisely where all these lost rivers went, let alone accurately enough to draw a meandering wiggle round Brixton Market. But I've previously spent hours researching the location of these lost rivers, far much more carefully than most other Londoners, and I never* thought "ooh no Tom, you're miles out on that one". Take each map with a slight pinch of salt, but also a degree of confidence that the river's course is pretty much accurate. The maps for each chapter link together to depict a suggested walking route for each river. Continue along Farringdon Lane, cross Clerkenwell Road and continue down Turnmill Street. They're all very clear, dead easy to follow on the ground (which, given that Tom's book is a walker's guide, I'd strongly recommend that you do). I've tracked all of these rivers in real life, and I recognised almost every street that Tom's walking routes follow. He's missed out a few tributaries to keep it simple, but that's because following tributaries rarely makes for a satisfying linear walk. Follow his instructions from Hampstead down the Fleet (or Tyburn) (or Westbourne) to the Thames, and you can have confidence that you're following the right valley all the way. If I have a major complaint, it's that Tom's been highly selective which rivers he's written about. All the big lost rivers are included (Fleet, Tyburn, Westbourne, Effra), and some of the smaller ones (Walbrook, Earl's Sluice/Peck, Neckinger), which is great. But there's no Falcon Brook, nor Hackney Brook, nor Stamford Brook - probably because they don't make for quite such interesting walks. Most unfortunately there's no Counter's Creek, which I'd absolutely definitely have included, and would have made for a really interesting stroll past Holland Park, Earl's Court and Stamford Bridge. And then Tom blows it at the end by including the Wandle as his eighth river. Even though he admits it's more "mislaid" than lost, this a river that's fully visible for almost all of its length and really shouldn't be here at all. If you want photographs, Paul's book from earlier this year is hugely better. Tom's volume has only eight photos, all of an arty Polaroid style that's charming but not in any way informative. Here they are along with 55 others, in a gallery on Flickr, if you want to enjoy them for free. As well as better photos, Paul's book also features a more comprehensive selection of waterways, and is more dip-in-able. But if you want an authoritative guide to where London's lost rivers used to be, and how to track them down, Tom's your man. It's pricy, at £14.99, especially for a book that's thick but not especially large. Pocket-sized, I think you'd say, which is clearly more practical for a walking guide than something of coffee-table dimensions. Strange Attractor Press aren't a major publishing company, so we can't expect bargain basement bestseller prices. But I didn't regret a penny of my almost-fifteen-quid, because I know how much effort goes into writing a historical-geographical-hybrid transcript. I could have bought Tom's masterwork on Amazon for less, but I made the effort to pop into Rough Trade East in Shoreditch to pay full price to the independents. I hope his book sells well, even though distribution will be limited and its target audience isn't exactly mainstream. And I'd hope that several of you will want to acquire a copy, because if readers of this blog aren't target audience then I don't know who is. Delivery Manager: The first item on our agenda is the introduction of two different tube map graphics to represent step-free access - from street to train and from street to platform. Strategic Director: Well, I think we can all agree it's been a fantastic success. We've achieved 100% diagram rollout across all business spheres in advance of key chronological milestone targets. Best value analysis indicates that map replacement has been achieved with minimal asset loss, and I can assure the board that we're now meeting all key delivery targets against agreed accessibility criteria. Next item? Project Sponsor: Not so fast. I know we've plastered the tube map with blue and white wheelchair symbols, but haven't we missed something? Strategic Director: I don't think so. The launch of our new map-wide symbolic interface means that the mobility-challenged are now fully up to speed on access arrangements at all Underground stations. In particular, with the white circles, we've made it crystal clear precisely where our wheelchair-based passengers can reach the platform but not get onto the train. That's just what our customers with walking difficulties need to know. Surely there can't be anyone still confused? Project Sponsor: Ah, but there's a tube map we haven't tweaked yet. I'm talking about the line diagrams in carriages - those long linear schematics above the windows. Shouldn't we be incorporating these into the great white-blob/blue-blob rollout too? Strategic Director: Excellent idea. All of our existing line diagrams include only one colour of step-free circle, so we need to introduce two colours at the earliest possible opportunity. We'll stick a key in the top left corner of the map. Blue circle: step-free access from street to train. White circle: step-free access from street to platform. Let's start on the District Line. Delivery Manager: Excellent idea. There are seventeen step-free stations on the District line, so this new initiative will be exceptionally useful. Project Sponsor: Except all of those seventeen stations are white circles. A passenger in a wheelchair may be able to reach those seventeen platforms from the street, but they won't be able to board the train unaided because the gap up to the carriage is too high. There are no blue circle stations on the District Line. Strategic Director: Never mind. I still want a blue circle in the key, even if there isn't a blue circle on the map. It makes us look forward-thinking. Delivery Manager: And then we should move on to the Piccadilly line. There are fourteen step-free stations on the Piccadilly line, so this new initiative will be exceptionally useful. Project Sponsor: Except all of those fourteen stations are white circles. The step-up from any platform to a Piccadilly line carriage is too high for wheelchair users. There are no blue circle stations on the Piccadilly Line. Strategic Director: Never mind. I still want a blue circle in the key, even if there isn't a blue circle on the map. It makes us look accessibility-friendly. Delivery Manager: And then we should move on to the Metropolitan line. There are eight step-free stations on the Metropolitan line, so this new initiative will be exceptionally useful. Project Sponsor: Except all of those eight stations are white circles. Again, the vertical gap between the platform and the carriage floor is too high. There are no blue circle stations on the Metropolitan line. Strategic Director: Never mind. I still want a blue circle in the key, even if there isn't a blue circle on the map. It makes us look like we care. Delivery Manager: And then we should move on to the Northern line. I happen to know that the Northern line isn't all white circles, so this new initiative will be exceptionally useful. Project Sponsor: Except there's only one blue circle on the Northern line. Just one station with step-free access from street to train, and that's London Bridge. If you're a wheelchair user and you wheel yourself on board at London Bridge, then you're stuck because you can't get off again anywhere else. One blue circle, by itself, is pointless. Strategic Director: Never mind. I still want a blue circle in the key, even if there's only one blue circle on the entire line. It makes us look like we've made a good start. Delivery Manager: And then we should move on to the Jubilee and Victoria lines. I happen to know that there are eleven blue circles on the former and four on the latter. Here, at least, this new initiative will be exceptionally useful. Project Sponsor: Exceptionally useful, oh yes, exceptionally useful. Delivery Manager: In that case, let's roll out this white/blue system to all of the diagrams on all of the remaining lines. To the Bakerloo line, with its zero blue circles. Strategic Director: Let's do it! Delivery Manager: To the Waterloo & City line, with its zero blue circles. Delivery Manager: To the Hammersmith & City line, with its zero blue circles. Delivery Manager: To the Circle line, with its zero blue circles. Delivery Manager: To the Central line, with its zero blue circles. Project Sponsor: Entirely superfluous. Indeed, no self-powered wheelchair user could ever board a Central line carriage in the first place, which means providing special line diagrams for them is beyond stupid. Strategic Director: Let's do it anyway, for consistency's sake. Delivery Manager: Excellent. So that's a pan-network rollout for an information system which is entirely irrelevant on nine out of eleven Underground lines. We'll start replacing all the line diagrams immediately. Well done everybody. Same time next month? When I moved to Bow ten years ago, I liked the fact that I was moving somewhere with a bit of character. Not a huge amount, nothing truly outstanding, but enough to reassure me I wasn't moving to a dull identikit suburb. Ten years on, as major housing projects infill here, there and everywhere, that character is slowly ebbing away. Shame, that. I live in the heart of a 14th century village, not that you'd easily tell. The church is two months short of 700 years old, although now cut-off in the middle of a dual carriageway. In Victorian times the church used to be the nucleus of a thriving commercial community with shops, pubs and a theatre, but today people merely live here. 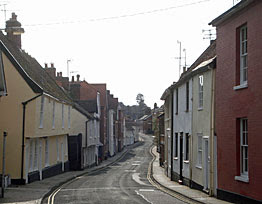 The south side opposite the church was entirely wiped away in the 1930s by a development of austere council blocks, eradicating centuries of history. The north side retains some character and the occasional listed building, thank god, but the locale's a shadow of its former self. All of this I can cope with, none of the immediate area has changed substantially since I moved here. But step a short distance down the road, and the landscape is inexorably changing. Take the western corner of the Bow Flyover roundabout for example. 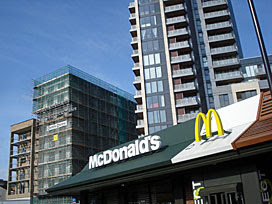 First they snuck a McDonalds drive-through on a patch of redundant wasteground, imposing a chunk of mid-Atlantic architecture (illuminated 24 hours). Then they worked out there was room for a 14 storey tower block, so they built that, in a boxy and rather uninteresting yet unavoidable way. And then the church nextdoor sold up, allowing developers to build a tower even more nondescript than the first, with fresh space for their congregation on the ground floor. That's nearly finished now and, although the old church was little more than an uninspired box, its replacement is much the same only harder to miss. There's nothing here now that couldn't be somewhere else - nothing memorable, only bland. The Blackwall Tunnel Approach Road wrecked this neighbourhood in the 1960s. Whole streets were eradicated, a major roundabout and flyover constructed, and a chain of motley warehouses and businesses constructed alongside. Nothing lovely, unless you're a fan of galvanising plants, office blocks, transport cafes and biker hideaways. But a damned sight more interesting than what's lined up to replace it. Because 2011 is the year when the developers moved in to remove all traces of the late 20th century and replace it with the future. They've been demolishing a string of properties along Hancock Road - one day standing, the next a pile of broken masonry. Scaffolding's just gone up on the block that housed the greasy spoon ("Breakfasts, Lunches, Open 6am-pm") so I guess that can't be much longer for this world. A major regeneration is afoot, generating a 35 hectare "homezone" along the banks of the Lea. By my calculations only about a dozen homes will be lowrise townhouses, while all the other 680 dwellings will be in multi-storey blocks, with the tallest wall of steel and glass reserved for the aspect facing the main road. Massive, generic, worthy, commonplace. A few hundred yards further down the A12, that's where Tesco Town is planned. You remember - Tesco want to build a new superstore by the river, then knock their old store down and build residential units by the road. They're throwing in a hotel, library and primary school for good measure, but only to maximise the proportion of local disposable income that shops here. There's not a hope of the project being complete for its original 2012 deadline, indeed there's very little forward movement at all. For now the old Tesco continues trading, and the old office block opposite Bromley-by-Bow station stands bereft and empty with its windows smashed, awaiting demolition. But one day the entire swathe of land from the railway line north to the flyover will be refreshed and rejuvenated, allowing thousands of new residents to live where currently only a scant hundred work. The future here, and in so many other parts of London, is piles of tiny boxes crammed onto the site of something that used to be more interesting. I was in Woodbridge at the weekend, a delightful Suffolk market town whose heart has somehow avoided being ripped out by commercial interests [photo]. The High Street still winds in a too-narrow-for-traffic way, because nobody insisted they knocked the old shops down to make way for cars. A ring road bypasses the town centre without wrecking the outskirts. And the houses along Cumberland Street, well, I sighed with pleasure as I looked at them. A higgledy-piggledy collection of old cottages and Georgian terraces, of an enviable kind that nobody builds anything like any more. Instead we get eco-homes and piled-high apartment blocks, because in the future it's more important to build more than to build better. 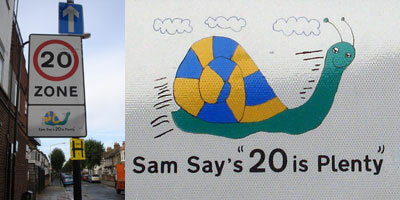 Obviously I can't equate historic East Anglian townscape to my inner-city patch. But when it comes to designing the buildings where Londoners get to live, economics dictate, and aesthetics come a poor second. My neighbourhood's been changing fast, and it's about to change faster. St Andrew's Hospital beside Bromley-by-Bow station has almost completed its transformation into brick-pile Barratt tedium. Stratford High Street is rapidly turning into an incoherently designed highrise highway. Most of the old factories on the Sugarhouse Lane site are being demolished in readiness for their rebirth as yet another upstanding residential estate. Then post-2012 the development of the Olympic Park, just across the road, will vastly increase the acreage given over to relentless conformity. I understand the pressures that London's increasing population brings, and maybe it's good that the Lower Lea Valley is seeing a big share of that growth. But cramming thousands of people into architecturally suspect boxes, replacing interesting old with tedious new, risks turning my corner of Bow into Anywheresville. Alas, I doubt there's any force can stop it. To celebrate it being ten years since leaving Suffolk, I thought I'd go back. There were so many places I never visited back then, because I didn't spend my time scouring the local area for interesting things to blog about. I even had a car then, which I don't now, which made getting to my chosen spot rather trickier than it would have been in 2001. Better late than never. It was luck, really. The greatest archaeological discovery of the century, all down to an unlikely series of consequences. Somebody else would have uncovered everything by now using infra-red scanning or satellite photos or some other technology, obviously, but back in 1939 it took a man with a trowel. His name was Basil Brown, and he's the reason Sutton Hoo is famous. When Edith Pretty moved into her new home on a hill overlooking Woodbridge, she never guessed what might be lurking in the undergrowth on her estate. But her burgeoning interest in spiritualism made her wonder, then believe, that one of the mounds on the ridgetop might contain buried treasure. She called in Ipswich Museum, who sent Basil, and he sunk a quick shaft but found nothing. Undaunted he decided to explore some of the other barrows close by instead, unearthing some rivets and handful of minor treasures, but it appeared that everything of value had been plundered by grave-robbers in centuries past. The summer of 1938 passed without major incident, and the secret of Sutton Hoo remained buried. The next year Edith invited him back, told him to investigate the big one or else, and this time Basil dug a proper trench. He found more iron rivets, but this time arranged in a regular pattern, and soon realised he was excavating an unusually large ship. 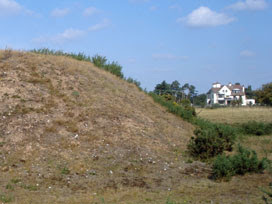 Somehow, quite fortuitously, this mound's contents had evaded the persistent attention of thieves and survived intact. The British Museum were called, and they rushed up to Suffolk and took over, demoting Basil to the sidelines while the real treasure was uncovered. Hundreds of ornate items of gold and jewellery, the remains of swords and shields, and various accoutrements that an Anglo-Saxon king might want in the afterlife. No body, nothing organic, but most of the metal objects had survived the chemical bloodbath of a deeply acidic soil. Coins dated the hoard to about 625AD, suggesting that this might be the tomb of Raedwald, leader of the East Angles, but nobody's ever proved that conclusively. All of the ancient artefacts were painstakingly catalogued and removed, stored in Edith's house for safe keeping, then carted off to London. And only just in time, because World War 2 broke out days later and the dig had to be abandoned forthwith. A coroner's inquest in the local village hall decided that the entire hoard belonged to Edith, an unimaginable fortune, but she humbly chose to bequeath everything to the British Museum a week later. That's why, if you want to see the finest treasures from the site, you have to head to London and not to Suffolk. 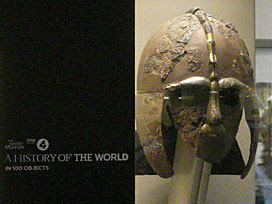 The Sutton Hoo helmet is an astonishingly rare and intricate find, and usually has pride of place in Room 41. Alas, that's closed for renovation at the moment, so Hoo seekers will have to make do with one of the many reproductions elsewhere, or the Radio 4 series "A History of the World in 100 objects", or a trip to Edith's old estate above the River Deben. The site today is owned by the National Trust, and could be any old patch of East Anglian farmland were it not for the visitors centre and car park. The story of the Sutton Hoo hoard is told in a specially constructed exhibition gallery, which includes a reconstruction of what the wooden burial chamber in the heart of the sunken boat might have looked like. There is, naturally, a restaurant and a shop, the former considerably busier yesterday than the latter, but then there's still three months to Christmas so nobody needs National Trust notelets or gift boxes of toffees just yet. In a nice touch, Edith's home has been restored to provide a 1930s counterpoint to the Anglo-Saxon site on the ridge. Members of the Sutton Hoo Society dress up as the butler, or as ladies visiting for afternoon tea, and the house's entire period contents can be handled as well as enjoyed. If you visit, I strongly recommend you pay a little extra to join a guided walk. It's only a short walk from the visitor centre to the area where all the excavations were made, but the guides bring the whole place to life which stories of what did, and what might, have happened here. Even better they'll take you inside the roped-off area, walking amongst the 17-or-so mounds and pointing where the horse was buried and where the gallows stood. And, even better still, they'll take you up onto the mound itself (which beats standing on the low viewing platform behind an ill-placed tree). It's not the original Anglo-Saxon earth, because that's been reconfigured several times by archaeologists, but there is a thrill in climbing up onto the boat-shaped hump beneath which our island's ancient history was so perfectly preserved. Look, I don't want to worry you, but someone does. If you're planning on travelling around London during the Olympics, please try not to. The capital's going to be chock-full of visitors trying to use roads and trains and tubes and buses, so it would be terribly useful if you didn't. And yes, I know this isn't news, they've been saying this for ages. But what is news is that we're starting to get proper specifics about precisely how bad it's going to be when. - During the Olympic Games, the Tube and DLR trains will run up to 90 minutes later than normal on all days, including Sundays. Last trains from central London will leave around 01:30. - National Rail services from London will operate later than normal. Last trains for both suburban and inter-city destinations will leave London termini typically between 00:00 and 01:00. Actually this doesn't sound at all bad, does it? Whether you're heading back after Volleyball at Earl's Court or returning home after your regular late night drinking session in Wood Green, TfL are running extra trains for you. It's only for a fortnight-plus, but bring it on. London Bridge station will be very busy and should be avoided, including interchange, at peak times. These include 7–10am, 12noon–2pm, 4–7pm and 10pm–midnight. National Rail passengers heading into central London should use Cannon Street and Charing Cross instead. This sounds less fun, though. For the duration of the Olympics, please don't use London Bridge station. Please go to one of two other stations, even if they're not anywhere near where you want to go, to sacrifice yourself for the greater good. Things should be fine between 10 and 12 in the morning, and mid afternoon, but don't you dare hang around past 4pm otherwise the hordes will descend and you may never escape. OK, I know I'm totally over-interpreting this, but TfL's advice appears either over-specific or over-simplistic (or both). Bank station will be very busy. If you are not attending a Games event at ExCeL or Greenwich, this station should be avoided at peak times. There will be additional trains running to and from Tower Gateway on most afternoons and evenings to assist avoiding Bank. Blimey. Sorry if you're a banker in the City, or a cleaner at the Guildhall, or needing to change lines to get somewhere. You're not wanted at Bank, stay away, because they'd rather the station was for the exclusive use of folk with Equestrian tickets or those off to watch the Taekwondo. Everybody else, bugger off. Obviously this attempt at frightening Joe Public will never work 100%, but if TfL can scare sufficient passengers away from Bank with tales of woe then transport gridlock can hopefully be avoided. The Tube and DLR services will run later on 27 July to enable spectators to get home. The last Underground trains will leave central London around 02:30. Be aware that services will be very busy later in the evening, so prepare to leave earlier if possible. People not planning to watch the Opening Ceremony in central London (eg, Live Sites) are advised to go home as early as possible. Just read that last sentence of advice again. If you're not deliberately staying in town to watch the Flame-Lighting on some big Panasonic-sponsored screen, go home as early as you can. Forget any normal stuff you might do on a Friday like travelling to choir practice or going round your Nan's for tea, just get off the trains and leave them for the proper people. Again, I know, I'm over-interpreting, but TfL's official advice reads disturbingly like they're proposing a curfew. Friday 3 August will be twice as busy as previous days in the first week of the Olympic Games and is predicted to be the busiest day of the Games. In general, the second week of the Olympic Games will be much busier than the first. People are advised to work from home or take leave on Friday 3 August. Here's a very specific recommendation - to keep out of the bloody way on Friday 3 August. Try to rearrange your lives to stay at home (maybe wash the car or something), or go and stay with your auntie in St Albans. Perhaps see if you can persuade your boss to close the office, or do videoconferencing, or just doss around at home on full pay. And no, I don't know anyone who's got a ticket for the Olympic Park on Friday 3 August either, but hundreds of thousands of people have, so LET THEM PASS. Paddington station will be busy due to Games Family departing for Heathrow Airport. Links to other airports are also likely to be busy so please check with the service operator prior to travel. This is expected to be the busiest day at Heathrow. Let's not knock the forward-planning here. You really don't want to find yourself at Heathrow on 13 August surrounded by packs of VIPs with designer luggage, so this advice should help you avoid accidentally booking your summer holiday on that date. Likewise you don't want to book a work's conference for 27 July, or organise a hen party for 3 August. Forewarned is a crisis averted. And this is just the tip of the Olympic travel iceberg. There's so much more to come, including (in November) a line-by-line breakdown of precisely which parts of the tube are likely to be overcrowded during the Games, divided up into 30 minute slots. Take pity on the poor Olympic transport planners attempting to make sure that our capital doesn't come to a grinding halt while the eyes of the world are upon us. But let's hope they find a slightly less patronising way of shepherding us around town when the mega-fortnight arrives. And when it is suddenly hell to get anywhere, don't say you weren't warned. On a map, this looks wholly underwhelming. For much of its route this section follows the North Circular Road, or the A1, or some other major dual carriageway, which should have been miserable. But I needn't have worried. This turned out to be a fascinating trek across a part of London I don't know very well, with secluded streams and proper hilly bits. Delighted to make its acquaintance. Look not too hard and you'll see that Hendon Park has a distinctly Jewish imprint. My spiritual journey included a Kosher cafe in the corner near the station, the twisted arch in the Holocaust Memorial Garden [photo], a pair of young boys in skull caps and some Hebrew graffiti scribbled on the back of a park noticeboard. Then off down a couple of backwater suburban avenues, the sort that only gain attention because a long distance footpath plies along them. It's not far from the park to the North Circular, here a depressing swathe of slow-motion tarmac, and even less far until the path slips off into a neighbouring sliver of woodland. That shallow channel between the trees, that's the Dollis Brook, a six-mile tributary of the River Brent that flows down from up Barnet way. Here it's somehow survived as a linear park, hemmed in between the backs of houses and impatient queueing traffic. There are lakes and weirs and dragonflies and herons, if you're lucky, plus solitary blokes eating sandwiches on benches. Just don't stay too long in this leafy hideaway, else the exhaust fumes might exceed recommended levels. Next up is a tributary of the tributary, the Mutton Brook, whose milky waters combine beyond a narrow iron footbridge [photo]. The Capital Ring follows this minor stream for some considerable distance, ducking first through a long white tunnel beneath the A406 [photo]. Barnet Council have erected two sentinel globes to keep an eye on this minor subway, one eye staring from either end, whose downbeat presence served only to remind me of the serious kicking I might face here before the police could ever respond. The next half mile turned into a mile and a bit. 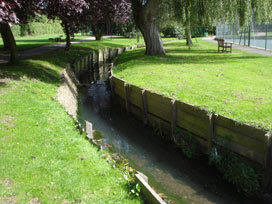 The brook runs alongside a grassy common, which would be very pleasant were the footpath not currently blocked off for roadworks at Henlys Corner. I was forced to divert past a construction village and cross the very major road at pedestrian-unfriendly lights, which is one of the scariest things I've done recently. At least my detour took me past La Délivrance, Finchley Road's famous naked swordswoman, which otherwise I'd have missed [photo]. But the official diversion turned out to be ridiculously (and ultimately unnecessarily) circuitous, assuming that every passer-by was in a wheelchair, whereas a quick stroll down a slope and across a short field would have curtailed the excess walk for almost all users. OK, back to the Brookside Walk. The Mutton Brook starts to look a trifle more artificial from this point on, hemmed into a sinuous concrete channel which protects local residents should the trickle ever become a torrent. There's just enough grass on either side to give a big dog a runaround, rather more so further along as the houses start up again. These are the outskirts of Hampstead Garden Suburb, a pioneering domestic development that aimed to bring low density high quality homes to the masses. Anyone below upper middle class has long since moved out, of course, so aspirational have these early 20th century properties become. The Mutton Brook was utilised to provide an arcadian aspect to the new estate, winding its way through Northway Gardens round the back of an imposing parade of shops [photo]. I paused here for a chocolate croissant from Kings Bakery (cheap, giant, kosher, delicious) before continuing into the local recreation ground and wolfing it down while no residents were watching. The next road has the delightful name of Norrice Lea (surely one of Hyacinth's Bucket's acquaintances), in which stands a redbrick synagogue the size of a small secondary school (opened in 5722 by the Chief Rabbi). These are the sorts of street where patio-layers, window cleaners and tree surgeons spend their weekday afternoons, which may help to explain why genteel HGS is so much lovelier than the mundane street where you live. i) Cherry Tree Wood comes first - a leafy triangle which might more accurately have been named Oak And Hornbeam Wood, but that isn't so catchy. Mind your head, it's acorn-plummeting time of year. ii) And then, up a surprisingly lengthy sloping alleyway, Highgate Wood. I cannot believe that I hadn't been here before, but my mistake. Its 28 acres are owned by the City of London, which perhaps explains why they've been so well looked after. This is ancient woodland, as the presence of Wild Service trees attests, and there are earthworks and gravel pits in the undergrowth if you know where to look. 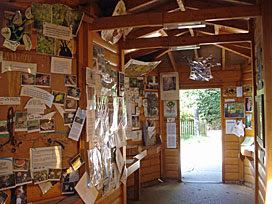 It's easy to find out, because there's a Wildlife Information hut open daily, jam-packed with nature notes, photographs and maps. "Please help yourself to newsletters and leaflets" says a notice on a box inside. The newsletters are all nine years old but the leaflets are multiplicitous and truly excellent (not least the free full colour 16 page guided walk booklet). Nextdoor is what locals call a cafe but verges close to a restaurant, serving up wholesome meals to those who want more and pots of tea to those who want less. 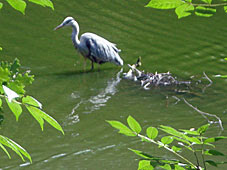 When the Capital Ring was launched in 2005, it's no surprise that Highgate Wood was selected as the location for the official plaque [photo]. What is surprising is the Capital Ring turns left at the plaque [photo], missing out the Woodkeeper's hut and Pavilion Cafe altogether (so make sure you carry straight on for a few yards and miss neither). I was proper taken by Highgate Wood, and wished I'd dallied longer. iii) But almost immediately, on the opposite side of Muswell Hill Road, comes the similar yet subtly different Queens Wood. It too has a cafe, but this one's distinctly log-cabiny and a little more organic. It too has fine trees, but denser and somehow less informal. It feels more undiscovered, more like proper woodland, as if Queens Wood could be several miles further out of town into the Green Belt. And it has narrower paths, and off-piste glades, and proper steep slopes, and shortly a carpet of crackling brown leaves underfoot. All this, tucked just round the back of Highgate station. Capital Ring 11, an unexpected winner. » Autumn Ambles: Walk London are organising sixty free guided walks across the capital this weekend. Most are in the centre of town and a bit sightseeing-y, but there are also several 'proper' walks further out, including some along the Capital Ring. Highly recommended, if you can be bothered to search through this user-unfriendly portal for the walk of your dreams. Life, nightlife, the sense of history, the Underground, the Overground, canalside strolls, the view from Greenwich Park, the fact there's always somewhere new to discover, cutting-edge architecture, classical architecture, curvaceous Regent Street, the chimes of Big Ben, nightbuses, world cinema, world cuisine, the world in a city, the 2012 Olympics, sunlight on the Thames, buying my Sunday paper on Saturday evening, the museums in South Kensington, the museums that aren't in South Kensington, not needing a car, the wobbly Millennium Bridge, being able to choose from more than two local radio stations, suburbia, Tate Modern, mudlarking, Hampstead, the view from Hampstead Heath, diversity, acceptance, mind the gap, four of Arsenal's Premiership away matches being nearly at home, strolling along the South Bank, Waterloo sunset, the view from the top of anywhere tall, low tide, festivals, sitting in the Radio 4 audience, Trafalgar Square, knowing that I could walk home from Trafalgar Square if I really had to, art-filled piazzas, 100% style, tracing a line on a map, taking the tram, realising that the person drinking next to me in the pub is a celebrity, the plurality of alternative routes, St Pancras station, the highest pod on the London Eye, lost rivers, not-yet lost rivers, decent mobile phone reception, free newspapers, cab drivers, memories embedded in every streetscape, heritage Routemasters, the tiles along the Victoria line, blue plaques, global landmarks, taking a shortcut down a back street I've never walked down before, realising that Dr Johnson was right, scouting the rural outskirts, Hawksmoor, Soane, Holden, watching the dawn over Tower Bridge, watching twin bascules rise, the forgotten corner of a Victorian cemetery, the West End, the East End, 24 hour bagel shops, 24 hour fridge-filling, culture on my doorstep, Banksy on the wall, an unexpected rainbow, deckchairs in Green Park, Roding Valley, the Embankment illuminated, eyeballing a famous person in the street, recognising where a film was shot, the DLR, sitting at the front on the DLR, meeting up with mates, 0° longitude, standing in two hemispheres, the City, parklife, fast trains to the coast, the view from Primrose Hill, far less fog than everyone imagines, snow on terraced rooftops, a good service is operating on all lines, Covent Garden, creative possibilities, the view from the front seat on the top deck of a bus, alleys, tunnels, the middle of Richmond Park, free-roaming deer, being out at 4am, an unexpected smile in the rush hour, the Gherkin, critical mass, Soho, pie and mash, Longplayer, the opportunity to pop into Parliament, street markets, lidos, late-openings, Open House, speeding down the river beneath world famous bridges, bleak estuary strolls, film premières, Farthing Downs, regular flypasts, garden squares, General Roy's cannons, not needing to drive home from the pub, postcode identity, hyperlocality, swiping my Oyster, pay-as-I-go, the smell of bacon from a Cabmen's shelter, undeveloped farmland, finding myself somewhere you've never been, Northala Fields, high streets that stay open after 5:30, art galleries that stay open after 6, always having something to do even when it's raining, Denis Severs' House, urban wildlife, a night at the dog track, the National, the Saatchi, the Serpentine, suburbs pretending to be villages, actual proper unswallowed Kentish villages, anything that Bazalgette built, crossing Oxford Circus diagonally, Sister Ray, walking faster than the traffic, standing under the dome of St Paul's Cathedral, living in a city that tourists pay £100 a night to visit, embankments, windmills, forest, hills, fields, Hilly Fields, the 4th plinth, Norway's gifted tree, the Geffrye at Christmas, gelateria, Limehouse to Little Venice, this not being Ipswich, following in Roman footsteps, New Johnston font, so many cinemas, still so many bookshops, wi-fi, 1908, 1948, E20, EL2, RV1, Zone 6, crossing Westminster Bridge at night on the back of a bike, Eel Pie Island, do not touch the walrus, do not feed the pelicans, Beckton Alp, the Hoover Building, gridlessness, reaching the middle of Hampton Court Maze, wondering what the Turbine Hall will hold next, international churn, the sheer variety of Theatreland, the contrast between Erith and Twickenham, it's only a short dash to the country, the British Museum, arthouse pop-ups, free stuff-to-do every weekend, whatever I want, anything I need, the anonymity of not knowing my neighbours, being one in eight million, collective consciousness, common ground, independence, togetherness, the fact it's not as scary as out-of-towners think it is, Metro-land, moquette, deserted Thames-side beaches, the buzz, infinite choice, the city's constant resilience, feeling alive, simply living here. I sold my car ten years ago today. I drove down to my local garage at lunchtime, handed over my car keys in exchange for a fat cheque, and waved goodbye to the world of driving. It felt good, at least until I realised I now had to walk the two miles back to the office. I sold my car ten years ago today. This was my first and only car, and I'd only had it for a couple of years. It had four wheels and an engine, and it was blue. I wasn't desperately interested in the specification beyond that. I'd only bought it because I had to, because it was a requirement of the job I'd been doing. But this was my last day in the job, and I wasn't sorry to see it go. I sold my car ten years ago today. I was living in a Suffolk village at the time. The village had only five buses a day, scheduled at times more useful to pensioners than commuters. The local shop was a tiny post office which sold sellotape and 7th birthday cards but not milk or bread. The nearest supermarket was too far away for a pedestrian, along rat-run country lanes I'd never risk on foot. Without a car I'd have been isolated and starving hungry. I sold my car ten years ago today. I gave up the opportunity to drive wherever I wanted whenever I wanted. I ceased hurling myself along fast rural roads in a fragile metal box. I abandoned my private bubble kitted out with blaring hi-fi and a glove compartment full of barley sugars. I willingly surrendered my independence, speed and comfort. I sold my car ten years ago today. I probably increased my life expectancy by several years as a result. I've never been a natural driver, never very confident behind the wheel. That time I found myself staring through a tilted windscreen into the bottom of a ditch, that's when it became clear my talents were better suited to the passenger seat. If a simple bend could defeat me, I knew I'd never be King of the Road. I sold my car ten years ago today. I never once considered buying a bike as a replacement. My driving skills weren't instinctive enough, so swapping four wheels for two never appealed. I'd have ended up in front of a bus or under a lorry, sooner or later, with no protective outer skin to shield me. So I abandoned the road for the pavement, and I never looked back. I sold my car ten years ago today. I stopped having to fork out hundreds of pounds annually on petrol, and hundreds more pounds on insurance, and hundreds more pounds on servicing and repairs. I stopped having to hunt for an appropriate parking space, and risking extortionate fines if I couldn't find one. I had to start paying to use public transport again, but overall I saved an absolute fortune. I sold my car ten years ago today. Nobody thanked me for my selfless action. Nobody gave me a certificate honouring the reduction in my carbon footprint. No East Anglian child noticed that the air they breathed was slightly less polluted. Nobody cheered when I stopped clogging up roads with three empty seats everywhere I went. No passing car drivers flashed their headlamps at me in deference to my greener lifestyle. I sold my car ten years ago today. I never really understood the appeal of driving, so selling up was no great loss. I still can't tell the difference between an Audi and a BMW, merely that one car might be silver and the other blue. I never watch Top Gear because it appeals to a petrolhead demographic I'm not part of. I'm much happier being driven than doing the driving myself, which explains why you'll find me blogging about public transport quite so frequently. I sold my car ten years ago today. I often wonder where it ended up. It probably started out somewhere in the Suffolk area, but it could be anywhere by now. Perhaps a young couple bought it and now there's a baby seat in the back. Perhaps it shuttles from a pensioner's garage to the supermarket and back once a week. Perhaps some joyrider smashed it into the central reservation of the A14 and now it's rusting in a tiny cube in some forgotten scrapyard. I fear I'll never know. I sold my car ten years ago today. I recognise that this was only possible because I moved from Ruralsville to BigCity immediately afterwards. But now I live somewhere where not having a car is the norm, and where sitting next to people on buses isn't sniffed at. I may have less freedom than I had before, but I also have less hassle and more money. Being car-free has made my life more carefree. And, I have to say, I wouldn't have it any other way. Last year, for no especially good reason, I visited lots of London's Town Halls for Open House. This year, for even less of a good reason, I visited lots of non-Town halls. And what a lot of different non-Town halls there were. Freemasons' Hall: That's New Thames House, the MI5 HQ, if you watch Spooks. 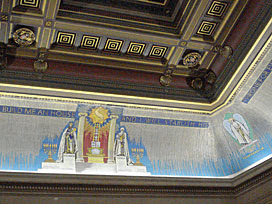 Or it's the centre of UK Freemasonry, the United Grand Lodge of England, if you're a man with a trowel. Blimey, what a building. A tall white Art Deco masterpiece on the edge of Covent Garden, with lofty belltower and towering columns. On Saturday those columns were plastered with car-related sponsorship, thanks to a London Fashion Week event that was taking place inside. At the side entrance waited a queue of uber-trendy dolled-up wannabes, for whom blown-back hair and unfeasible footwear were de rigueur. Meanwhile at the front entrance, beside a promotional Vauxhall, a trickle of less well-dressed Open Housers arrived for a scout inside. The interior is magnificent, as you might expect from an organisation nominally dedicated to the building trade. First up are three vestibules, blessed with stained glass windows and ornate spiky ceilings. These lead through bronze doors to the Grand Temple, which is essentially a rectangular-ish auditorium topped by a stunning painted roof [photo]. Here many visitors sat down to soak in the splendour of the azure blue mosaic cornice, or perhaps to wonder what strange trouser-rolling ceremonies might have taken place before the Grand Master's throne. Careful eyes would have spotted the Square and Compasses motif everywhere, perhaps atop a pillar, perhaps in the supports of a footbridge. The official route passed through the Library, open to the public as part of the Museum of Freemasonry, should you fancy a look around some non-Open-House day. And then a winding route back to the street, past mysterious rooms full of tapping fashion journalists, and beautifully coiffured stylists, and workmen lugging lighting equipment. Most peculiar, quite surreal, when three worlds collide. Methodist Central Hall: In a prime position opposite the entrance to Westminster Abbey, yet often overlooked, is a large religious building with an impressive history. 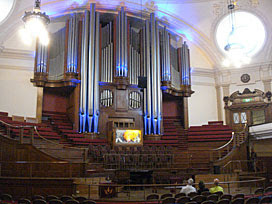 Central Hall was built to commemorate John Wesley's centenary, and comprises a mixture of spaces for worship, meetings and show. At its heart is a theatre-like Methodist chapel beneath a massive concrete dome, with a colour-changing organ dominating the front wall. It's a very flexible space, used for services and community activities, and also the location of the first ever meeting of the United Nations in 1946. Various major public enquiries are held in the lecture hall downstairs - indeed it was very much busier here before the giant Queen Elizabeth II Conference Centre was built alongside. And if you've ever wondered precisely where the World Cup was when it was stolen in 1966, it was here. Understated, and they like it that way, yet a key London building for almost a century. Conway Hall: Next a gathering place that's definitely not religious. Conway Hall was built as the headquarters of a humanist group called the South Palace Ethical Society, to be somewhere they could come to discuss and orate and think. It's tucked away in the corner of a Holborn square, partly resembling an Art Deco cinema and partly a 1930s church hall [photo]. The brick facade seems narrow but shields a larger irregular site behind. It's like stepping back in time, walking in through the entrance hall, with a solid yet mundane aesthetic that's comfortingly pre-war. The main hall is off to the right, with the three-sided balcony accessed up a winding staircase, and acoustics to die for. On the stage here you might listen to an anti-racism speech, or lead an interesting conference, or attend the regular Sunday evening concert (they've been going since 1887 and are reputedly the longest running series of concerts anywhere in the world). "To thine own self be true" reads the inscription above the boards, which is a phrase from Hamlet, not that you're likely to find the Bard's works in the Library. Think more leatherbound psychology, back copies of The Skeptic and anything by Richard Dawkins. You have to admire the collective resilience that's kept this building functioning over the decades, and it's definitely somewhere to consider if you ever need to host anything uplifting, worthy and non-commercial. 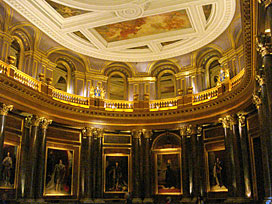 Drapers' Hall: A short bus ride into the Square Mile, a dramatic contrast. The Worshipful Company of Drapers is one of the three most important livery companies in the City, because people have always wanted to wear wool. The company's longevity has amassed it a great fortune, and some of that is on display as part of the sumptuous ornamentation throughout the building. Nothing here's older than the Great Fire, and they've had two, while most of the excess decoration date back to Victorian times. Never leave a plain surface when it could be heavily patterned, appears to been the motto of the various architects. All the rooms are stunning, especially the Livery Hall with its marble pillars, ceiling frescos and ring of golden arches. One lady guide remembered attending the Coronation Ball here - an epic evening of dancing in this gilded bubble until breakfast was served the following morning. There's money in sheep, and this place proves it. Carpenters' Hall: What a difference a bomb makes. While Drapers Hall survived WW2 almost completely intact, Carpenters' Hall was destroyed when a gas main exploded along London Wall. The interior was completely rebuilt, slowly, gradually, throughout the 1950s, to create a modern twist on a traditional City HQ. Almost every surface and additional feature is made of wood, be that a panelled wall, a carved sculpture or a curving banister. Essentially the building allowed the Company's master craftsmen to show off, in teak or mahogany. The overall look may now be a little dated, but one careless flame is all it would take to spark a complete modern revamp. Chartered Accountants' Hall: There are several non-medieval Livery Companies, one of which belongs to the official overseer of Britain's numbercrunchers. The exterior along Moorgate Place may look Georgian, yet much of the interior is terribly modern. There are comfy-chaired alcoves where you can imagine being schmoozed by a client, plus a large bland conference hall where there must have been so many one-day seminars on tax legislation. But take a few steps to the original wing and there's a magnificent classical reception with parallel murals rising to a skylit dome [photo], and a library with a Venetian bridge across the centre. Not everything about accountancy is grey and predictable. If you've ever been to the toilet north of the Thames, anywhere between Acton and Bow, then you've contributed a little to the history of this building. The Abbey Mills Pumping Station is an essential link in London's sewage system, built in the 1870s by Sir Joseph Bazalgette and designed to speed millions of gallons of unpleasant liquids downstream. The pumps within raise the brownwater by forty feet into the Northern Outfall Sewer, thence slowly downhill for release into the Thames at Beckton. And the station still functions, despite being superseded by a more modern pumping station nextdoor, such was the genius nature of Victorian infrastructure. Courtesy of Open House, Thames Water allowed a handful of consumers inside the building this weekend, and we all enjoyed a fascinating two hour tour. It's a magnificent building, entirely unnecessarily so [photo]. 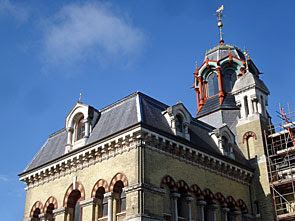 The Victorians had a habit of embellishing public projects, and Abbey Mills is no exception [photo]. The lantern on top earned the pumping station the nickname "the Mosque in the marsh", back in the days when nobody else lived anywhere nearby. Four Byzantine towers provide access to the roof, with rows of glazed tiles and carved limestone flora beneath to provide additional artistic flourishes. The building was originally cruciform in shape, before two additional boiler houses were added (only one of which survives). There were also two enormous chimneys topped by minarets, although those came down at the start of the Second World War when they were decreed a toppling hazard. A railway line brought in coal to keep the plant working 24 hours a day, and key employees were housed in a row of cottages close by so that they were always on call. The building is sometimes known as the Cathedral of Sewage, and it's easy to see why [photo]. Inside (oh yes, the tour went inside), the view's just as amazing. 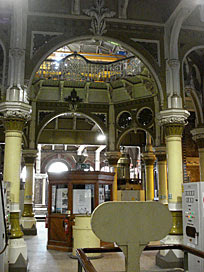 High ceilings, rising to the lantern's symmetrical windowlight at the centre [photo]. A raised level of intricate ironwork, originally installed to access a series of beam engines, until these were replaced by electric pumps in the 1930s [photo] [photo]. The replacements look like Daleks guarding the four corners of the building, and have recently been restored to provide several more years of service. Gaping holes in the floor lead down to thick pipes in chambers below, a curious mixture of old and very new. Around the walls are various dials and scales and chunky electronic cabinets, all now superfluous but part of the charm of the interior [photo] [photo]. Nobody works inside any more, not unless something here goes wrong. In normal circumstances, as and when, the entire station now runs automatically, controlled from elsewhere. In truth the old Victorian building doesn't need to function too often. A new aluminium-clad pumping station was opened in 1997, and only a couple of times a month does this still need support from its ancestor. There are eight pumping stations here in total, each lettered from A to I (but no G) and all of slightly different vintage. The original's A, boosted by B a few years later, then rather-large C built to disgorge excess greywater direct into the Channelsea River. The Channelsea still suffers when too much sewage needs to escape, which is why the Lee Tunnel is being built between here and Beckton to reduce the environmental impact on the Thames. Its pumping station will be wholly underground, leaving virtually no visible footprint, unlike the other tumbledown buildings we observed during our tour of the site. I'd never realised there was quite so much here at Abbey Mills, but now I'll look down from the Greenway with a completely new eye. The tour was excellent, thanks not least to our guide who delivered all the facts with humour and a knowing smile. He was accompanied by two Thames Water employees in hi-vis jackets, one of whom is the company's archivist and who later took us down to his repository. The room is stuffed full of files of plans, blueprints, photographic plates and manhole cover locations. On the shelves are some fantastically old volumes detailing all the original plans of London's Victorian sewers - giant leatherbound tomes labelled "Hammersmith to Bow" or "Counters Creek to Old Ford" or whatever - which are still referred to whenever developers want to build something new on top. The other employee works down the sewers, attempting to keep them clear and unblocked, and recently helped dig out a huge plug of cooking fat under Leicester Square. You wouldn't want to do it, but be damned glad that someone does, and that Bazalgette's supreme sewage solution survives. When I was small, my parents took me to the Commonwealth Institute. Or maybe it was the cubs. Or maybe I went with school. It was that sort of place - worthy, educational, dark - and not a building you'd visit for a wild day out. Outside stood an entire forest of fluttering flagpoles, while the inside was filled with a variety of exhibits relating to our former Empire. Some Rhodesian shields, some Inuit clothes, several garments made from beads and a lot of other ethnic bits from somewhere. But school trips can't sustain an underfunded exhibition, so eventually the Commonwealth Institute died. 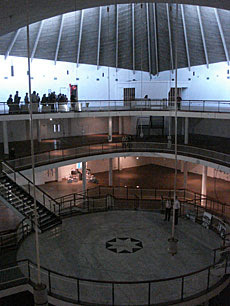 It closed its doors as recently as 2002, with all the exhibits relocated to Bristol and the structure abandoned to decay. Fret not, there may just be a happy ending. 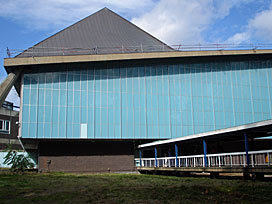 The Commonwealth Institute is one of London's greatest modern buildings [photo], deemed second in importance only to the Royal Festival Hall. It was built in the early 1960s to replace the Imperial Institute (a drum-banging tribute to colonial superiority since replaced by an extension to Imperial College). The new building on Kensington High Street was a precursor of the Big Society - underfunded by government and therefore reliant on voluntary donations. The hardwood floors were made from timber from Nigeria and the like, whereas the copper for the roof came from what's now called Zambia. And it's the roof that makes this building special, and without which it would have knocked down for housing a decade ago. Officially the roof is a hyperbolic paraboloid, although you'd more likely describe it as saddle-shaped. It was terribly advanced for its time, some would say over-ambitious, and proceeded to leak every time it rained. That's since been fixed, but what to do with the interior has been a headache ever the building was listed. The future has arrived courtesy of the Design Museum, which has outgrown its former banana warehouse in Shad Thames and plans to relocate to the edge of Holland Park in 2014. There's a lot of work to be done before then, which'll involve ripping out most of the interior and filling it in with new bits. Let's not dwell on that for now, and instead rejoice that for one weekend only the old Commonwealth Institute has reopened for Londoners to pay their last respects. The Design Museum's directors have been more than keen to showcase the building's shell for Open House, and were perhaps surprised that there weren't queues forming around the block to look inside. Last chance to reminisce, last chance to see. Entry from Kensington High Street is beneath a peeling covered walkway [photo]. This won't survive the renewal - one of three new apartment blocks is due to be squeezed-in here to surround the 1960s survivor. Let's not dwell on that for now, and instead let's head inside through the main entrance. It still says Welcome to the Commonwealth Institute on a colourful board inside the door, and then there's a lovely relief map highlighting our sister countries on the wall in the foyer. Bet that won't survive either. And then up the stairs (there are a lot of stairs, and no lifts - there was no disability access legislation in the 1960s) to enter the building proper. By 2014, if all goes to plan, the New Design Museum will open its doors and you'll be able to see the end results of the Institute's imminent transformation. But this weekend it's an old friend on the cusp of transition, and there really ought to be queues round the block to say goodbye. 224 Kensington High Street W8 6NQ, Sat 10.30am-4pm/Sun 10.30am-4pm. Access via tours only, last tour 4.15pm. 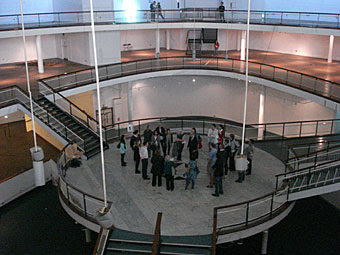 Tours of former exhibition hall led by Design Museum staff.